After seeing the film, “Descendents,” my sister remarked that it made her aware of all the superfluous chatter in life, that much of what we mean can be expressed without words. No doubt it was George Clooney’s eyes that spoke to her, nevertheless we are all capable of so much more in nonverbal communication. 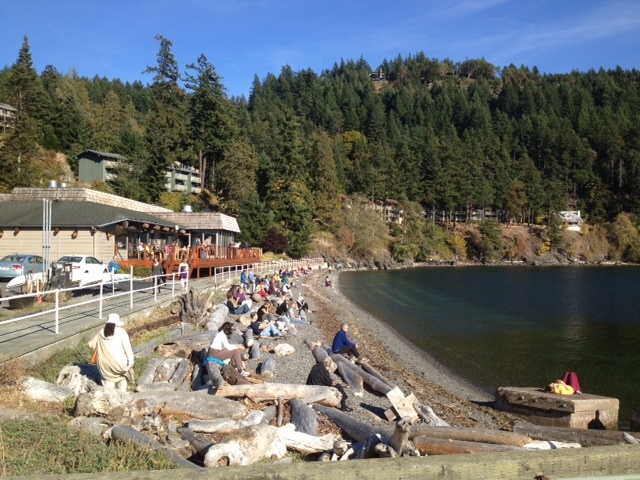 And while this blazingly beautiful Indian Summer of ours just won’t quit, my husband and I slipped off in the boat again for “one more weekend.” Pulling up at Rosario on Orcas Island, we came ashore as tens of people were pouring out of a seminar. They were out on a break and while most sat on the shore facing the sun, some lay down on the grass, or strolled singularly on paths. The notable thing about it was the quietude. None of the participants spoke. Not to each other, not to anyone. And we did not want to disturb it. Describing quietude is like trying to describe the dark. There is little light on land at night in the San Juan Islands. Soft lights from boats reflect, and diffuse, in the water. It is darker there at night. The sky, however, can be lit up like the Hayden Planetarium on the Upper West Side in NYC. Stargazing did for me a child, and this was again, such a night. We were taken with it, both the quietude and darkness. While on a walk at midnight, my husband encountered a deer. It was close yet he couldn’t see it. When he came back to the boat his description was of “a low hum, the sound of air moving fast.” We talked like this that weekend. We learned that we had arrived on the second day of an intensive, three-day, Tibetan Buddhist Tantric Retreat. Tom Kenyon was creating catalytic sounds by channeling a celestial musician, the participants found it transformational, and although we were not in the program, it affected us nonetheless. For the entire weekend we did not play the music we are usually fond of hearing out on the water, and I don’t know that either of us noticed. I wish I could write this from inside the retreat too, but no, I wouldn’t have wanted to spend all that time indoors. One of the benefits of boating is we can absorb all that good Vitamin D and raise our serotonin and endorphin levels through the roof. And if we go a bit overboard in the summer, it is because we are stocking up for all the gray months ahead. On the final day of the program–day three for them, day two for us– one by one, participants out on break began to say “hello.” It was as if they were resurfacing, and us as well. Time had stood still, it seemed, and now it was time to return from whence we all came. Soundlessly, people wandered off with their backpacks, and boats left their slips or moorage, more sailboats than motor. We hoped to bring some of it back with us, the sounds of silence and the lights of darkness. A lovely weekend… more for the sun and companionship than the silence. Today the ceiling changed with Pacific Northwest fog and overcast. Only one day and I long for summer….